One of the best parts of my job this year has been helping with the development of a new line of coned yarn for weavers. We looked for something close to home and are proud to say that the cotton is grown, spun and dyed in the USA. The fun really began, however, with creating the color palette. It was equal parts giddy excitement (I can pick any color I want!) and challenging (the colors have to play well together). I was satisfied with what we we put together, but even more so when I saw them all on the shelf – it just looks happy. 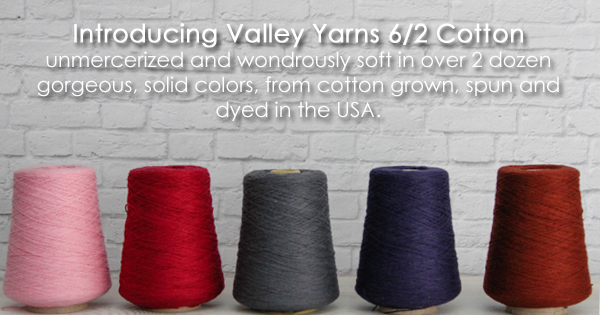 And now that it’s here, it’s time to launch our newest Valley Yarn – 6/2 Unmercerized Cotton in 30 gorgeous colors. A little heavier than the 8/2 cotton we know and love for dishtowels and and other household handwovens, the 6/2 is deliciously soft and cozy and will be perfect for blankets, throws, shawls and, of course, thicker towels. We have been sampling it in a variety of weave structures and the hand is lovely and shows great definition for laces and twills. We began brainstorming ideas for projects as soon as we got the first samples of the yarn and asked a few weaving friends to design drafts for us. Chris Hammel’s Summer Garden Towel was in our booth at NEWS and now you can buy the draft and weave it yourself. Thick and absorbent, this delightful towel combines the new Valley Yarns 6/2 Cotton with our Valley Yarns 10/2 Cotton and is woven in a Summer and Winter structure. I love the feel of it and I think I may expand the draft to weave bath towels for our house. We have more drafts to come – a summer shawl in a blended draft of lace with overshot borders, a dishtowel in a crepe weave and warm color palette, and here’s a sneak peek of the cuddly cozy baby blanket that is guaranteed to be the favorite lovey for a special little one. 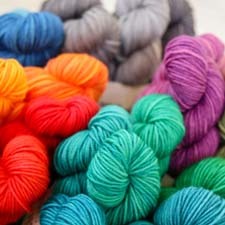 So join us in welcoming our new ‘baby’ – Valley Yarns 6/2 Cotton. What will you make with it? After a long winter it seems like spring is taking forever to arrive. I’m ready to shed the heavy coats and scarves and I’m starved for any pops of color or hints of cheer. It’s the perfect time for a quick project, something fun and colorful. Something like………..collapse scarves! 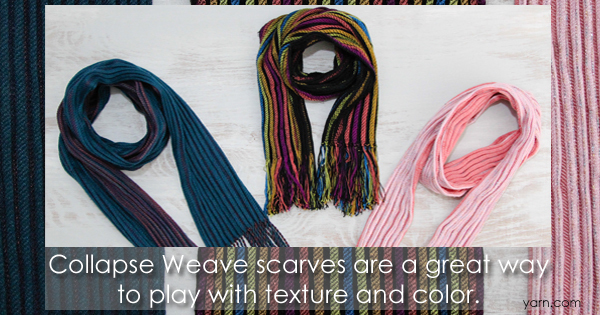 We have a trio of these, all using the same draft, #32 Collapse Weave Scarf, but each with different color combinations. They are a light addition to the wardrobe and a delightful weaving adventure. Collapse weave creates a fabric with nooks and crannies and provides endless room for experimentation. The pleating forms due to the weave structure and the combination of a weft that is much thinner than the warp. You can make it subtle or bold, spice it up with some glitz or play with stripes. It’s springy and sproingy and looks different from every angle. We used 8/2 Tencel for the warp and 60/2 silk for the weft. The combination, in addition to making the great texture, is soft and slinky with lovely drape. We just changed to a smaller size cone for our 60/2 silk, which means you can get more bang (colors) for your weaving dollars. This draft is also a great way to dip your toe in the ‘weaving fine threads pool’ by using the silk as weft. You’ll love how it feels and, I hope, encouraged to use it for warp down the road. So have some fun weaving a little spring something to lighten your step and brighten your day. And don’t forget to share pictures – we love show and tell! Greetings from the Weaving Room! I am re-energized by the signs of spring popping up outside and excited to get started on new projects, both on my loom and in the garden. I am finishing up a rather complex weaving project, one that taught me patience and helped me refine my process for keeping track of my place. 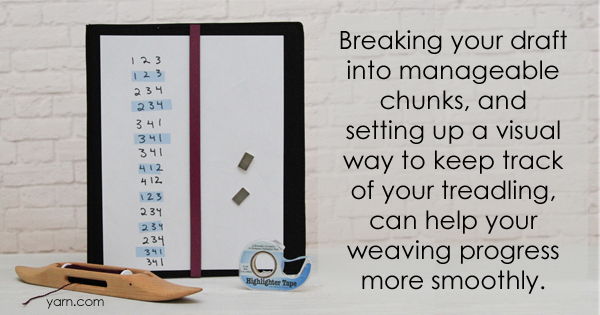 It is easy to get lost when your threading or treadling sequence is long, so I thought I’d share some tips that have helped me. Break it into manageable bits. I have read that our brains retain information in groups of 4 or 5, so I break the sequences into sections that are either 4-5 threads/treadles long, or contain a run such as 1-2-3-4-5-6-7-8. I find that I can keep this chunk of information in my mind while working and then look back at my notes for the next chunk. Write it out in a way that makes sense to you and display it so you can see it while weaving. Rather than working off a a typical charted draft, I rewrite my treadling on paper using thick markers (my eyes need all the help they can get!). I use the Knitter’s Pride Magma Chart Keeper to hold my notes and place it on the castle or on a table next to my loom. It has magnets to hold the paper on, and I can use the strip magnet to mark my place. It keeps my notes close at hand and easy to see and read. Use visual cues to remind you where you are. The scarf I just finished was an advancing twill with many repeating sequences (see picture) and sometimes I’d have a momentary lapse in attention (okay, it’s true. Sometimes I just zoned out.) and couldn’t remember if I had repeated 3-4-1 two or three times. The sett was 56 epi which added to the challenge of finding my place, plus it just slowed me down to squint at those interlacements! What I did was to mark which side of the loom my shuttle would be on at the beginning of each chunk. You can see in the picture that I used Highlighter Tape (another indispensable tool in my kit) to mark the sequences where my shuttle would begin on the left. It really helped me to quickly identify which point I was at. Stop only at the end of sequences and mark where you will resume. I try to work through a full pattern repeat before I step away from the loom. In the case of long repeats I will at least finish a complete chunk. And do not fall prey to the voice in your head that says you will remember/will be right back – always write down where to start again. In words that you will understand – cryptograms are best saved for code breakers. A toolkit of techniques is great to help you stay on track whether your draft is simple or complex. What tips work for you? We began our 40th anniversary series of drafts with a beautiful 16-shaft twill design from Barbara Elkins and end the year with a lovely baby blanket woven on a rigid heddle loom and designed by Leslie Ann Bestor, the new Weaving Manager for WEBS. It is a set of bookends that describes the weaving community in so many ways, touching on the breadth of experience, fibers and looms available. 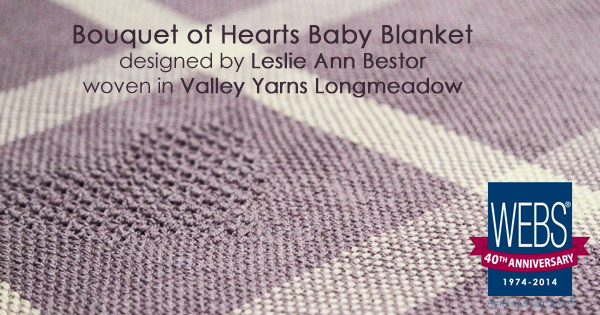 The Bouquet of Hearts Baby Blanket, woven with Valley Yarns Longmeadow, showcases both the simple beauty of plain weave and the ability to add intricate details that rigid heddle looms do so well. Brook’s Bouquet is a technique of wrapping small bundles of threads to create lace-like windows in the cloth. In the blanket, the motif is a heart, but you can graph out and add your own motif – anything from the baby’s initials to other shapes. Another key piece of the design, says Bestor, was to encourage weavers to work beyond the width of their looms and weave panels that can be seamed together. The seam can be done by hand or machine, invisibly or as a decorative accent. 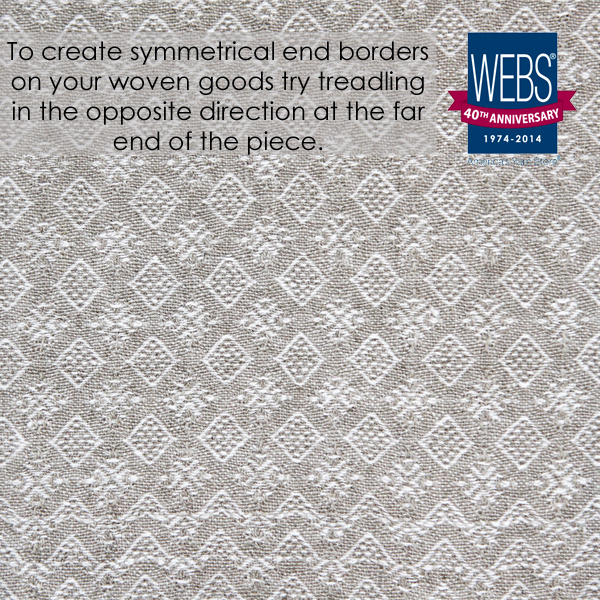 However it’s done, putting woven panels together expands the width – and the possibilities – of your loom. 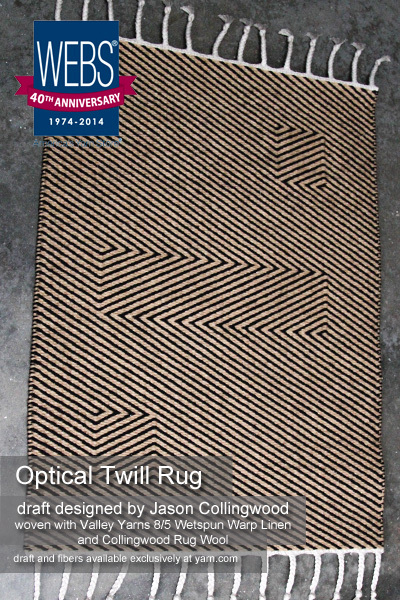 Weaving a rug is one of the great satisfactions of a weaving life and we are happy to feature the striking Optical Twill Rug from Jason Collingwood in our series of drafts celebrating WEBS 40th Anniversary. 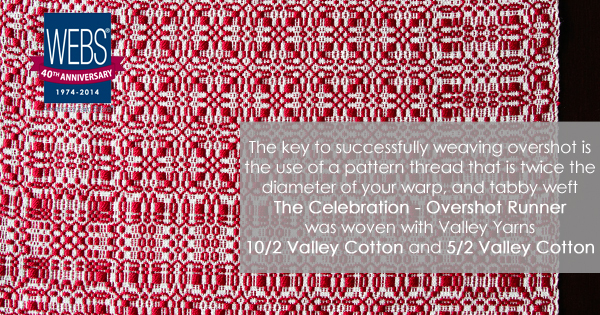 Jason is known internationally as a teacher and weaver, and continues the family legacy of rug design and weaving. 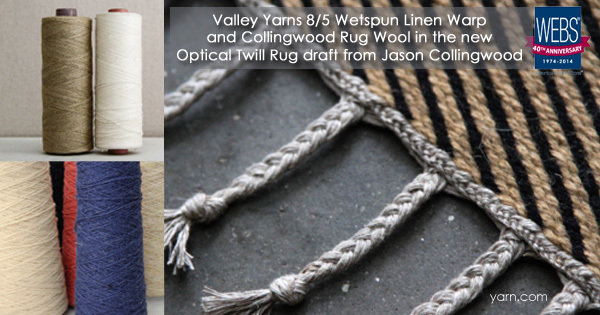 What I love about this rug is that Jason has set it up as a simple 2/2 twill and then shows how to add motifs that reverse the direction of the twill. His version has a central motif with two smaller ones at each end, but the instructions show how you can vary the size and placement of the motifs to create a unique rug. The rug features Collingwood Rug Wool, an exclusive line offered by WEBS, with 36 beautiful colors. The broad color range allows you to match the decor of any room. And the wool is spun specifically for rugs so it will hold up to any tap dancing hordes that inhabit your home. The other feature of this rug that I find so beautiful is the edge finish. Jason uses a half-Damascus edge which creates a braided look along the edge that matches the braided fringe. The result is a professionally finished edge that looks beautiful and will wear well. One of my goals as a weaver is to ‘clothe’ my house with handwovens. I’ve made the piles of dishtowels, some lovely table runners and blankets and I’m working on the design for lace curtains. This rug would look great in my front entry and I may have to wander past the rug yarn today and contemplate colors. 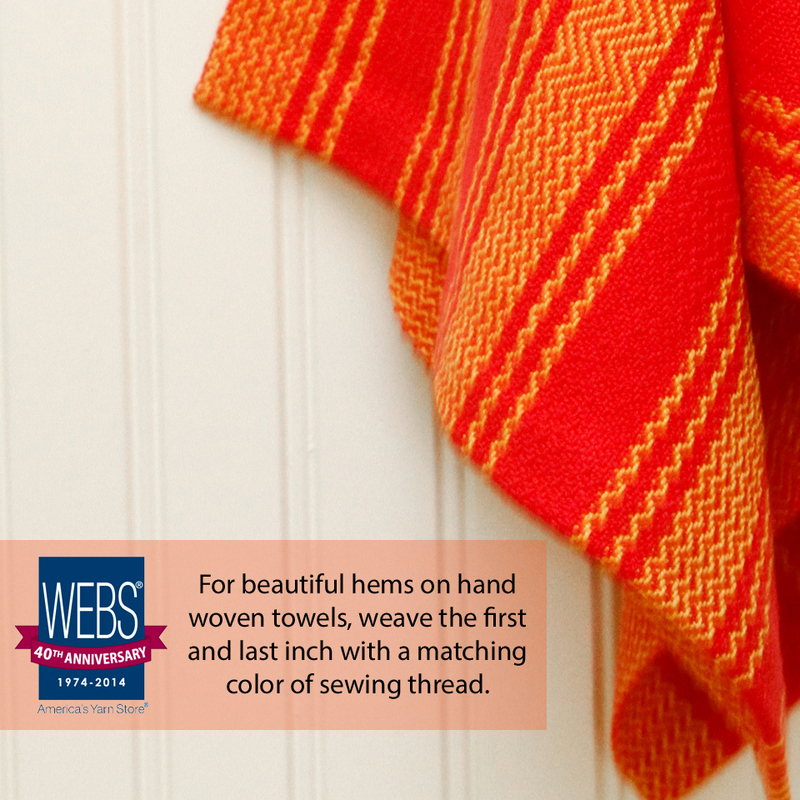 What have you woven for your home? 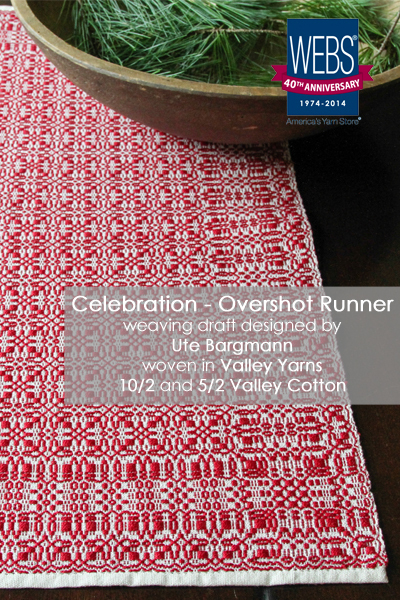 This month’s special 40th Anniversary Draft, the Celebration Overshot Runner, was designed by Ute Bargmann and is worked in our 10/2 Valley Cotton and our 5/2 Valley Cotton. 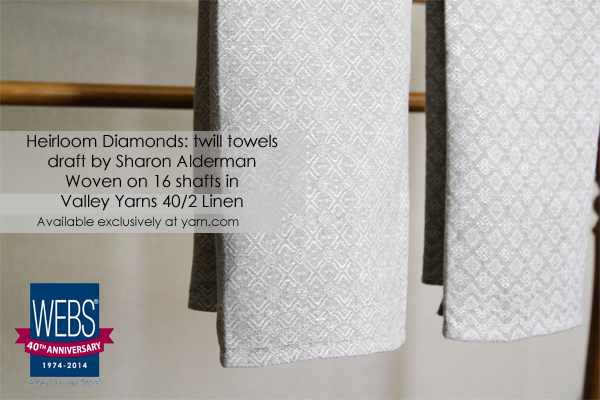 The newest weaving draft celebrating our 40th Anniversary is the Heirloom Diamonds twill towels by Sharon Alderman woven in Valley Yarns 40/2 Linen on 16 shafts. Valley Yarns 40/2 linen is perfect for fine linen towels as it is capable of rapidly absorbing liquids and allowing that moisture to evaporate just as quickly. Linen cloth can absorb as much as 20% of its dry weight in liquid before even feeling damp! 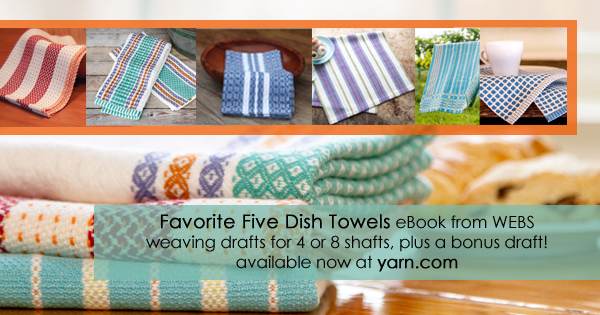 This 16-shaft draft will produce two heirloom quality towels for you to keep or give as cherished gifts. You’ll notice that there is a border not just at the selveges or at each end, but all the way around, framing each towel. The threading creates this border. The towels are woven so that the same borders happen along each selvege and at both ends. The treadling for the first end border is shown on the draft, the border at the other end is woven by treadling in the opposite direction. Our newest 40th Anniversary draft is a fun freebie! 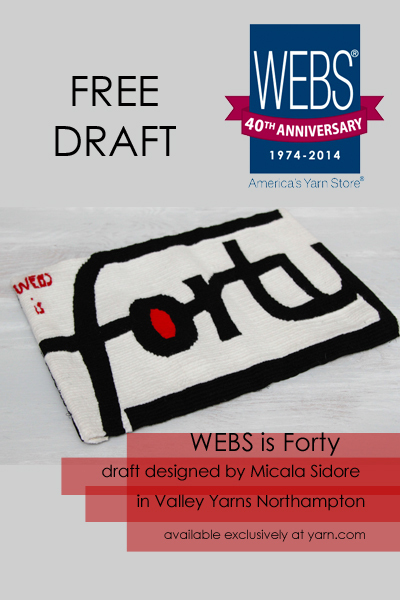 The WEBS is forty draft from Micala Sidore is a great primer for branching out with your own tapestry explorations and with 40 colors of Valley Yarns Northampton to choose from you’ll have almost endless color combinations to choose from. Micala says, “Using words as design elements in your tapestry gives you freedom to express yourself in many ways. The look of the tapestry, the words chosen, the “font” created, and the colors can all lend meaning to your work. To celebrate WEBS’ 40th anniversary, I chose to weave the word “forty”, but tapestry can be any word or number or symbol that is meaningful to you. 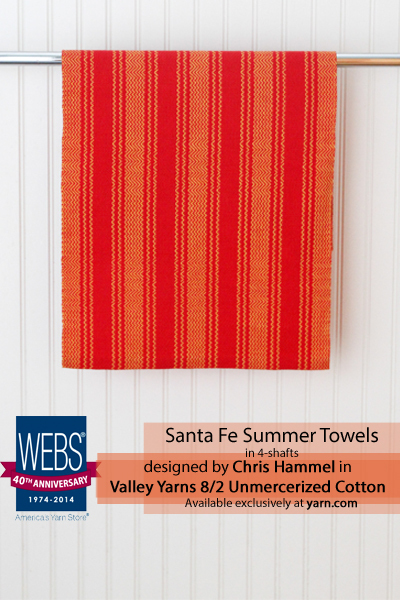 We’re smack-dab in the middle of Summer here at WEBS and thought that would be the perfect time to bring you The Santa Fe Summer dish towels from Chris Hammel as the 7th in our year-long series of special guest designer weaving drafts. Using sewing thread to weave 1″ of plain weave as the the under-hem for each end of the towel gives your hems a much less visible profile. Bonus: If you use a sewing thread like Gutermann you can pop the thread right onto your shuttle without needing to wind a separate bobbin!